€1900.00 Euros sleeps 13 people! This comfortable, spacious 5 bedroom villa sits on a generous corner plot and so has a high degree of privacy. No expense has been spared and it has a real homely feel. It is perfect for families who can take advantage of the play area, games room and roof top table tennis. It's location also makes it ideal for beach lovers and golfers, Elviria has some of the best beaches (including the famous Nikki Beach) along the coast and there are many fantastic golf courses nearby. This home from home is also the perfect place to relax with its lovely outdoor lounge and dining area overlooking private salt water pool and the beautiful, mature gardens. There are shops, bars, restaurants and taxi rank within walking distance (less than 10 mins) and the nearest beach is just a 15 minute walk. Elviria has a lovely 'square' with tapas bars, restaurants, bars, banks, bakery, money ex-change office, hairdressers, dry cleaners and supermarkets. the next junction along towards Marbella you will find Lidl and Mercadona supermarkets. Outside space: The grounds are approximately 1300 sq meters and there is off road parking for up to 3 cars. The villa is approached through a security barrier onto the urbanisation and then an electric gate leads onto the private driveway. The gardens have been beautifully landscaped with mature trees, palm trees and orange, lemon and fig trees. The outdoor lounge and dining area can be fully enclosed with sliding flameless glass and opens out onto the terraced barbecue area complete with gas barbecue making it the the perfect place for alfresco dining. Security: For peace of mind, this villa is secured with an alarm linked to the local security service who are only 1 minute away. In the summer the water is heater by solar power ensuring plenty of piping hot water. Pool table that turns over to become air hockey also. Super property in a great location. Ideal for families. Walking distance from the beach and the commercial centre where there are plenty of restaurants to choose from. I booked this villa for a group of Ladies who were attending a business-related Conference in Marbella. As we are all good friends, we tagged on some extra days and I cannot recommend this villa highly enough. The agent, Nicola, was so attentive. She was very professional from the first moment of making a booking enquiry. On arrival, she greeted us out of normal working hours at a 'meeting place' as the villa is located in a gated residential area, very beautiful, just to make things easier for us to find the property. The villa has everything, it is beautiful, the gardens very well maintained and the pool is a lovely size. It is a great villa for a family holiday, but equally brilliant for any group of friends who wish to spend some time away relaxing in a luxury environment. We were a family of eight adults, one four year old, one eighteen month year old, one one year old and a two month year old. The villa was perfect for us all, so much space inside and out. The pool area was lovely and we spent most of our time there, swimming from early morning till late at night. The villa has a lovely garden which was great for the two older children. Inside had everything you needed, a well equipped kitchen and plenty of space for everyone. We would well recommend this villa for families of all ages. We didn't have a car but beach, restaurants and supermarket all close by. There is a taxi rank by the supermarket so no problems with carrying your food and drink supplies back to the villa.Thank you Nicola for all your help before and during our stay, it was just perfect. On arrival Nicole was easily contactable and accommodating. This was our 2nd stay and the villa was no disappointment. Plenty for adults and more importantly children, to keep occupied and all imaginable appliances or needs met in the property. It was a pleasure to stay the only negative is that we had to leave. Looking forward to our next return although we will definitely car hire, as there is so much to do in the surrounding areas. Thank you Rebecca for that! Well hopefully I will see you all again next year, keep in touch! What a fabulous holiday at Powderham villa. Our family ranged in ages from 5 to 68 & we all loved it. First off Nicola the property manager was brilliant from booking to any queries to meeting her there. The villa was very well equipped, had everything you needed. No need to take hairdryers or beach towels. The kitchen had all you need if cooking in. We felt very safe within the gated community & also a private gate to the villa which was important having a 5 & 6 year old. The garden is huge with plenty of space to relax or have some private time if you need to. Pool area was brilliant & cleaned twice both weeks. Lots of inflatables there from past people & we left loads for the next lucky people. Couldn't have wished for a better holiday. Location is quiet even the square which is a 10min walk. But lovely for a meal or a quiet drink. Marbella centre is only €16 in a taxi. Definitely worth a few trips in to experience the old town/restaurants/cocktail bars. Bus service available too & the beach is only a 10min walk. We would all go back in a heartbeat. Lots of famiky memories made. What an amazing villa! 11 of us (6 adults & 5 children) stayed here for 2 weeks and we never felt in each other's way. To be honest we sometimes couldn't find each other - the place is so big! Our favourite place was the garden and pool area. So many gorgeous plants, flowers and palm trees, it was like a tropical oasis! The pool was used from sunrise to sundown, and was such a nice place to cool off after laying in the sun-trapped garden! It is bigger than it looks in the picture too. When we did want shade we sat in the little area overlooking the pool where there are comfy chairs, and nice views towards Elviria Hills. There are nice little touches such as pool inflatables, a Bluetooth music speaker and blankets for the chilly evenings. Inside the villa, the living room was massive, with a big TV with loads of English channels. The bedrooms were big, light and airy, and the bathrooms were modern, and lovely & clean. The location of the villa is excellent - the fact it is on a gated development makes you feel safe, and even though there are lots of villas on the development, it was surprisingly quiet. Most of the time, all we could hear was birds singing. It is best to have a car to explore the area fully (we managed to fit 3 Fiat Puntos on the drive), but you can still reach places without a car. We walked to Nikki Beach in 15 minutes, and there are bars, restaurants and a little shop within 10 mins. There is also a big Lidl within a 5-min drive. And if you love your British products, drive to the far end of Marbella where there is an Iceland! If you want to explore the Costa Del Sol further, I recommend day trips to Gibraltar and Ronda, and also hiking the Caminito Del Rey - such amazing scenery! We absolutely loved our holiday here and cannot fault anything. We will definitely be back! Thank you to Nicola as well who was always at the end of the phone, should we have needed her! Although we didn't need to contact her once! (Sorry for dragging you out at 1am on a Sunday morning when we arrived though!). 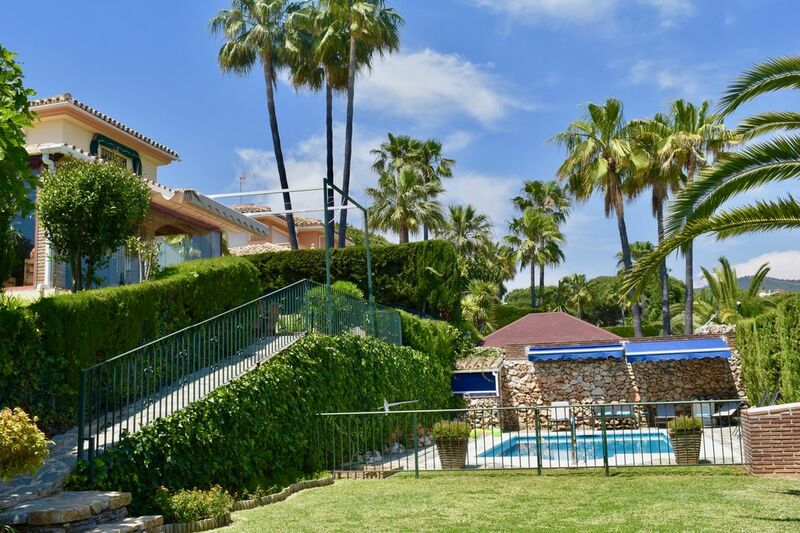 This lovely, family friendly villa is located in East Marbella in the village of Elviria, just a short walk from shops and restaurants and just a 35 minute drive from Malaga Airport. The beaches of Elviria are some of the best on the coast and are only a 15 minute walk away, Nikki Beach is also located in Elviria. There are many beautiful golf courses nearby including Santa Maria Golf and Rio Real. The famous marina Puerto Banus is 15 km and the beautiful centre of Marbella is approximately 8km. There is a pharmacy within walking distance and the main Costa Del Sol Hospital is just a 2 minute drive away. La Canada shopping centre is a 5 minute drive, the water park is 15km and the popular amusement park Tivoli World is in nearby Benalmadena, as is Selwo marina with dolphin and sea lion shows, and a crocodile park. Seville is only a two hour drive and a one hour drive from the romantic village of Ronda. The historical city of Granada (Alhambra) is also a couple of hours away.